Recently, I made an amazing discovery. I was at the butcher’s counter at the grocery store, standing in line for a great sale they had on chicken breasts. After waiting 15 minutes, I was informed that the store had run out of stock. “Could I get a rain check?” I asked the butcher. I glanced back to the people behind me. They shrugged their shoulders as if they had no idea what the butcher was talking about. “Come on man, it was in your ad,” I persisted. “Keep moving bottom feeder,” he said. Angry, I walked out of line, but when I came to the sign in the window I stopped. Immediately, a woman walking into the store read the sign, shook her head, turned around and walked out. “What did you do? !” the butcher was furious. He tried to erase the “for clowns” portion from the sign but a customer saw him do it and accused him of trying to pawn off clown meat on the general public. I decided to test this theory elsewhere. The route almost instantly cleared out and my ride to work was smooth. A friend of mine, an accountant said he couldn’t hang out with me because the tax deadline was approaching. I added the words “for clowns” after the sign that read “April 15th is Tax Day” and his scheduled cleared right up. I didn’t feel Panera Bread’s Summer Offerings menu wasn’t summery enough, so I added “for clowns” to the advertising. Then things really got out of control. 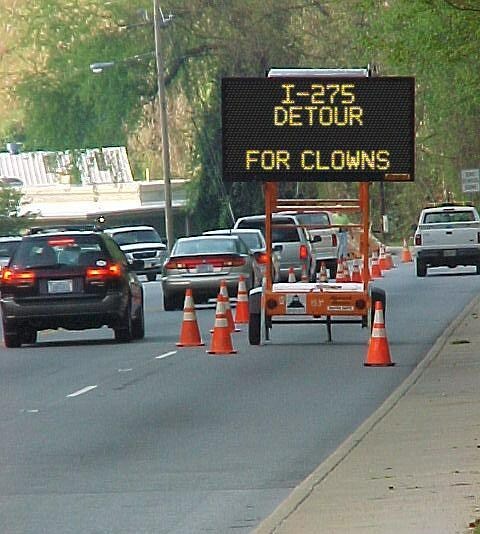 I added “for clowns” to the stop sign at the corner that I felt was unnecessary and traffic flowed freely. The mayor was furious with me. “You’ve turned this place into a ghost town!” he yelled. “Maybe you should add “for ghosts” to the signs,” I suggested. One day, I was in a bar when a gang of angry clowns stormed in. They said I had made their lives a living hell. With that, it was a deafening symphony of beeps, honks, boings and bells as the clowns beat me mercilessly. I awoke in a puddle of seltzer (or, at least I assumed it was seltzer. It kind of tasted like 7-Up). I decided to make it up to the clowns. 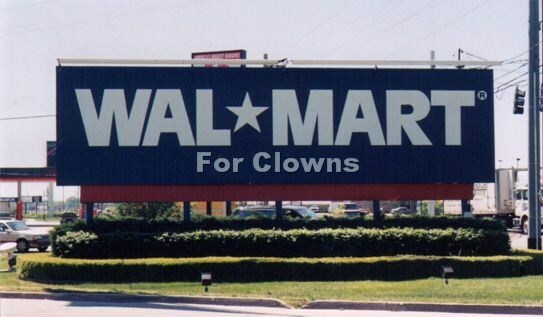 I traveled to the circus and removed the word clown from every bit of advertising. 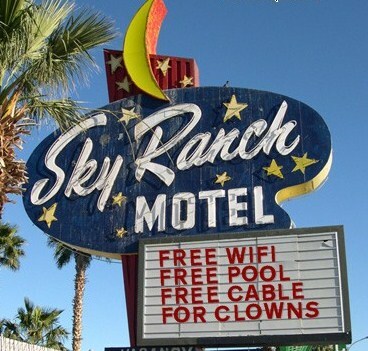 Unfortunately, this ruined business for the clown show and the circus had to shut down. Now, I don’t mess with signs at all. I realized, they’re around for a reason. In fact, I now go around town and add the words “do not enhance the signs” to the signs. I’m not sure if it’s making a difference. It has caused a number of traffic accidents, though. Hilarious!!! Loved that you included proof of the hacked road sign. For clows … I just come from a funeral and this really makes me laugh out loud!!! Tim, I heard you like to wear baby clown t-shirts. I started feeling uneasy after “clown meat”. It wasn’t the meat OF clowns, it was meat intended FOR clowns. Feel better? I started feeling easy after ‘clown meat’. It’s Disgusting Thursday. Comes before Offensive Friday. Things pick up on Saturday though. Stop it. Your avatar scares me. Such minor things…such major consequences. I know the scenario well. For example, I once inadvertently caused a full evacuation of a radio station with salt, triggering a full Whitehall apology. I’d like to be able to say I made that up, but I can’t. Yip. It’s the spice of life.